Devils' Evan Mosey in action against Nottingham. Pic: Panthers Images. Elite League ice hockey officials have suspended Nottingham Panthers player Jaynen Rissling for six matches following his mid-ice hit on Cardiff Devils’ Evan Mosey. The department of player safety also banned Devils’ Layne Ulmer for three games after he left the players bench and fought Rissling. Ulmer was applauded by many spectators because he was sticking up for a team-mate, but DOPS took a dim view of the incidents. They described Rissling’s check to Mosey’s head as ‘reckless’ after the reviewed a hit which left Mosey motionless on the ice. On the Rissling check, DOPS’ verdict is: “The incident is deemed as Category 2 – ‘Reckless’ – a deliberate and/or dangerous action with no concern for the result, with a conscious action to provoke, through intent and a wilful purpose. “With play moving into the Cardiff Devils’ attacking zone, and Cardiff’s Jake Morissette in possession, a set up play ensues. 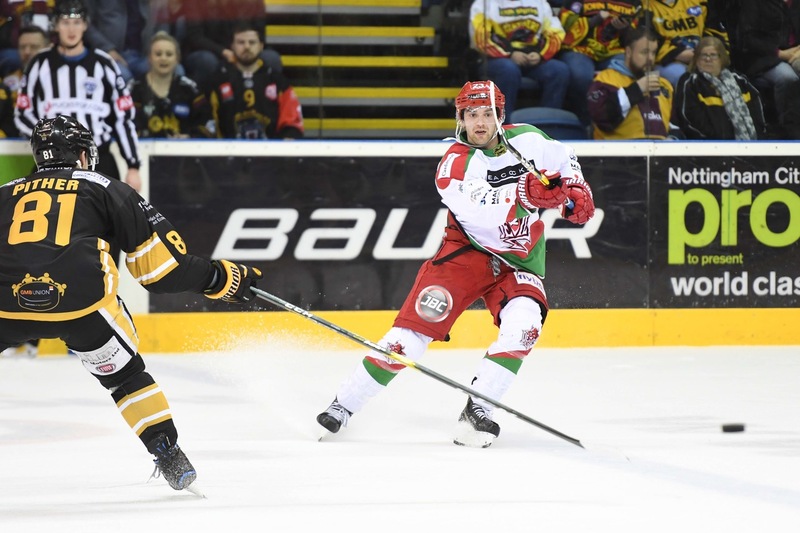 “The play opens up the ice for the Cardiff Devil player Mosey coming in from the high side to the slot area and receiving a pass from the top hand side. “This led to Mosey having a split second wait for the puck to gain possession and for his sight line and attention to momentarily switch to the puck. At the same time, from the opposite side of the ice Rissling is approaching at a high rate of speed to make a check on Mosey. “Considering the incident at full speed, it is important to note that from the pass to Mosey to the body contact by Rissling occurring is just over one second. “With time, space and speed all taken into consideration, it is felt that Rissling did not have time and was not deliberately or intentionally making a body check with head contact. “However, in all incidents, when an illegal action occurs that is avoidable, the responsibility is on the checker to avoid head contact. “The reason for supplementary discipline is that contact occurred initially and primarily to the head of the opposing player. Due to the two players skating in the opposite direction to each other, the force to the head area is with greater impact, which caused an apparent injury. “It is deemed a check to the head and considered reckless and endangering. “It was also taken into consideration that during the 2018/19 EIHL season, #93 Jaynen Rissling is a repeat offender for contact to the head of an opposing player. “The first player from either team to leave the players’ bench or penalty box during a player confrontation on ice will be assessed a double-minor penalty and an automatic game misconduct penalty. The incident was reviewed by DOPS. “When play was stopped Ulmer was not on the ice. The stoppage in play was lengthy due to an injured player. “In the course of the stoppage Ulmer entered the ice at some point (not seen on video). “After the injured player left the ice Ulmer skated the to the Nottingham defensive zone and started a fight with Rissling. “While the DOPS accepts that the intent and purpose in starting an altercation is clear, if Ulmer felt he had to take an action to fight, the stoppage where he entered the ice from the players bench was not the time to pick. “Players are fully aware of the rules regarding leaving the bench to start an altercation. For all situations where a player leaves the player or penalty bench to engage in a fight the minimum suspension threshold is three games. Ulmer will miss the first three EIHL Devils fixtures in February. They are Manchester Storm away on Saturday plus home games against Sheffield Steelers the following evening and Coventry Blaze on Saturday, February 9. Both home games are at the Viola Arena in Cardiff Bay.